In the late fifteenth century, the small country of Portugal was neither particularly rich nor particularly significant. One of the five Kingdoms of Spain that had arisen in the wake of the Spanish Crusades, the young country was “Europe’s Wild West”; a poor cousin in largely backwater corner of the world. Europeans at this time had two great concerns that were inextricably linked together. Firstly, they were increasingly addicted to expensive exotic goods from the East, especially spices – goods ranging from cinnamon to pepper to cardamom, which were used for both medical and culinary purposes – but had no real idea where they came from. Secondly, the inflow of these wonders into Europe came through exclusively Muslim trade routes, which meant Christian countries were paying huge sums of money to merchants from nations that were considered to be the enemy. Without the knowledge to seek spices for themselves, Christian Europe was being kept poor and frustrated by this trade. For Portugal, this humiliation was made all the worse by the close existence of the Moorish state of Granada within Spain. We all know that in fourteen hundred and ninety-two Columbus sailed the ocean blue – and in doing so he kick started an unprecedented age of exploration and discovery for Europe. Not to be outdone by the expedition sponsored by their neighbours in Castille, Portugal’s new King Manuel I (“Manuel the Fortunate”) decided he would mount his own voyage of discovery: a daring trip to see if it was possible to sail around Africa to the Indian Ocean and find the fabled Indies – and the sources of the much coveted spices – for themselves. It was to be an impossibly daring and hugely ambitious expedition, especially for such a small nation. While Portuguese sailors had previously succeeded in reaching southern Africa before, none had made it around the Cape of Good Hope and it wasn’t known if such a passage was even possible – Europeans didn’t know exactly where India was either, so the men chosen to undertake this trip were in effect sailing off the edge of the map. Should they succeed, Portugal could start importing its own spices, thus taking the lucrative trade away from exclusively Muslim control, and bringing glory and prosperity to their nation. Should they fail, the men would die in some unknown land and never seem their homes again. It was a massive gamble. The man chosen to mount the trip was Vasco Da Gama, a minor gentleman of the Portuguese court and a surprise choice for the leader of such a high profile adventure; despite much research, it isn’t really know why he was ever chosen for this task at all. Setting off in 1497, he led what would be the first of three voyages into the Indian Ocean, voyages that established a brief Portuguese Empire in the East; changed the flow of trade and commerce in Europe and around the spice routes; and started a change in the balance of powers between the Christian and Muslim worlds that can still be felt today. Although not as well know as Columbus in the English-speaking parts of the world, Da Gama left a huge impression on history, one that is thoroughly and enjoyably explored in Nigel Cliff’s new book The Last Crusade: The Epic Voyages of Vasco Da Gama. This is a book that will appeal to history fans who don’t want to wade through dry, academic texts. It is a long read, but I found it a worthwhile one – although I would have liked to see a few more maps and images included in it to support the text. He makes clear the scale of the achievement of Da Gama and his crews while holding nothing back in equally discussing the cruelty and tragedies they were involved in; it is a very balanced text, and one that (substituting oil for spices) has a great resonance with the world today. 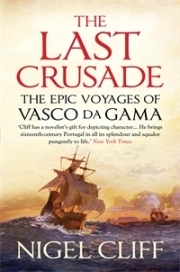 No Comments on "The Last Crusade: The Epic Voyages of Vasco Da Gama"